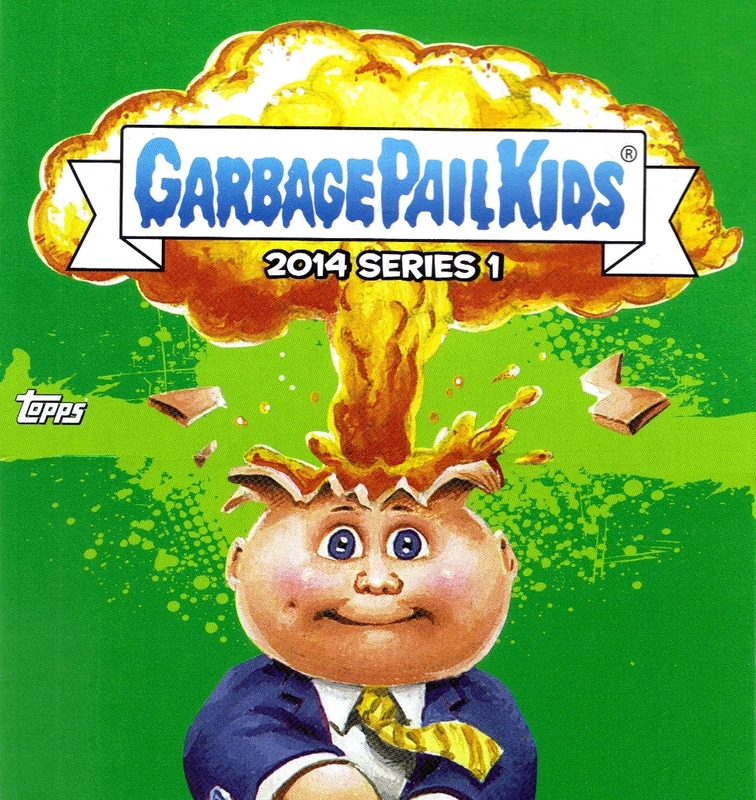 Garbage Pail Kids are back for 2014 and we thought we’d take a look at what madness Topps has brought us this year. 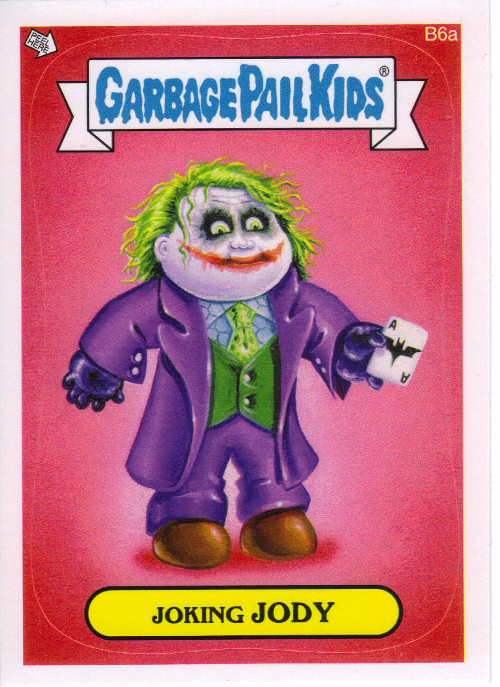 2014 Series 1 has a basic set of cards totaling 132 cards (66 different characters both with an A&B name) You have a lot of the fun play on words type of names like Freddy the 13th and Cerber Gus……. 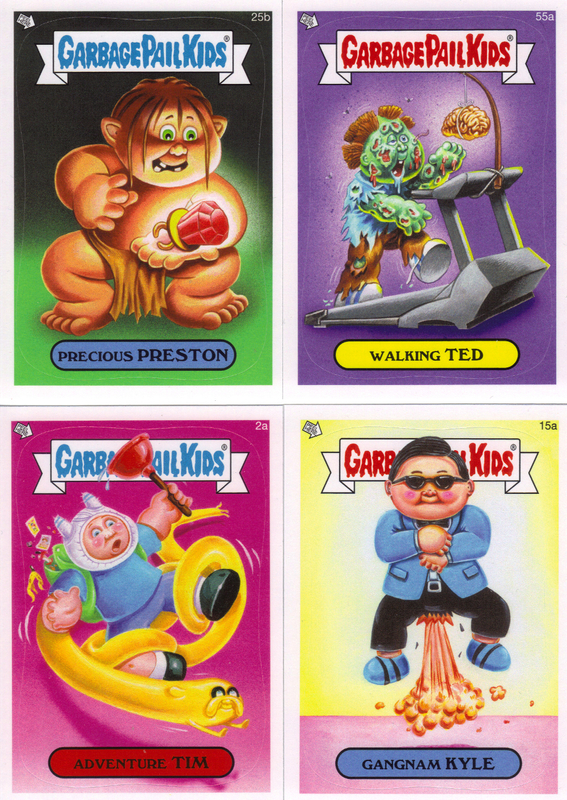 …..But there’s also a ton of pop culture GPK’s as well like Walking Ted and Gangnam Kyle. This series came out last month just a few days before the Sochi Winter Olympics, so of course Topps dedicated the final 11 characters to the Olympics (or Olym-Picks as they call them) These cards all depict classic characters like Adam Bomb and Patty Putty competing in Winter Olympic events. 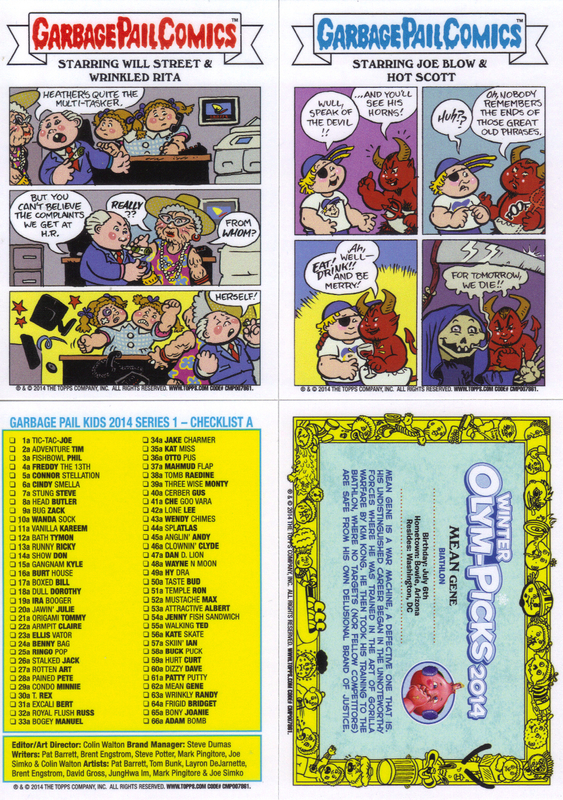 The backs of the cards have classic GPK elements like Comics, Checklists and the Olym-Picks cards have a bio telling you how the character wound up in the Olym-Picks. 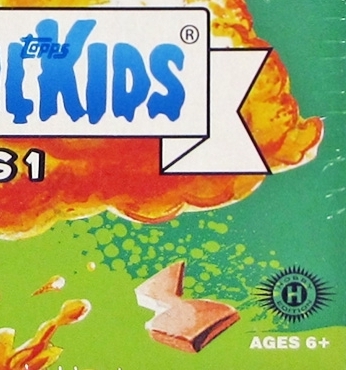 A large number of cards have a classic GPK staple on the back of them…..
….Puzzle Pieces! There are 11 different 9-card puzzles that can be completed including two of my favorite cards, Da-Da-Donna (Seen here) and Walking Ted. So with the basic set out of the way, we now move on to the Chase cards. 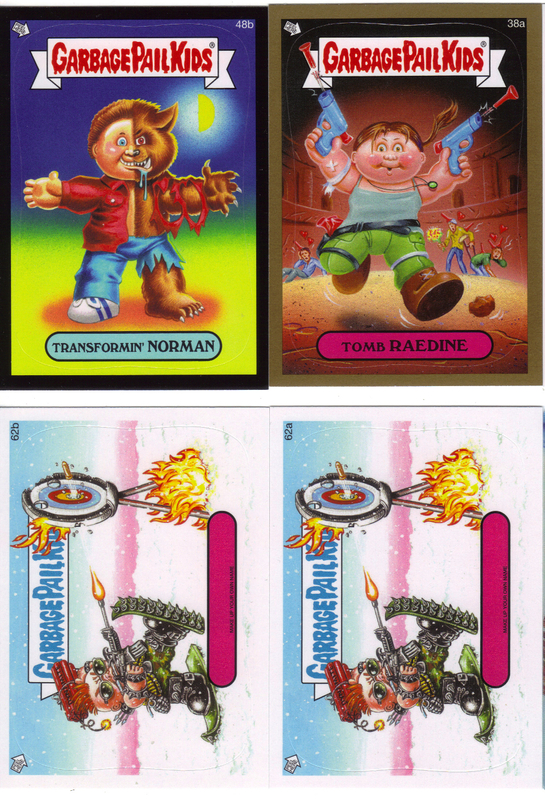 There are a TON of chase cards in this series. 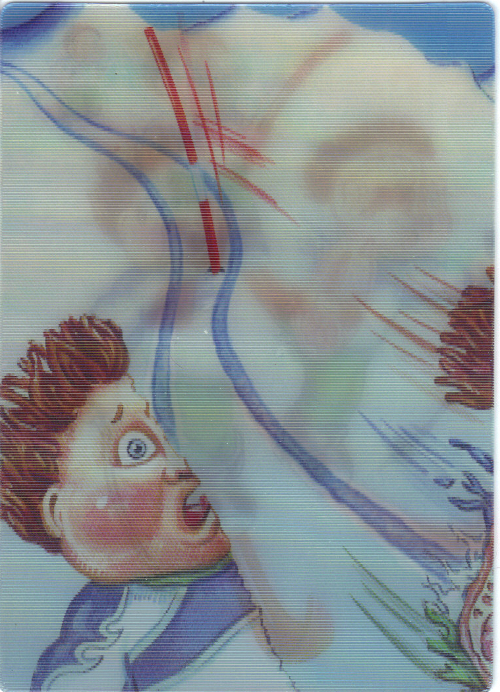 The more basic chase cards are ones like you see above. There’s a full set of the basic cards in both Black, Gold and Metallic Red Borders (Called Parallels) There’s also a full set (A&B) of create your own name cards. These cards look just like the regular set, but the name oval is blank. Speaking of blank items, there’s a very rare set of regular cards with a completely blank back of the card. There’s also a set called Full Bleed Canvas that have a canvas like texture, a set of Sepia toned cards and a set of cards printed on cloth. All of these are just for the basic set characters artwork, there’s even more chase cards after that! 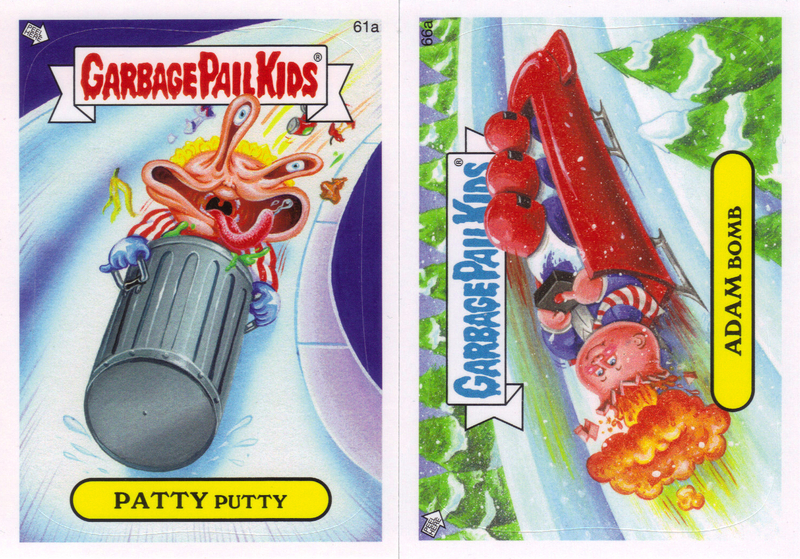 Continuing with the Winter Olympics theme, there’s 30 Medal cards you can collect. 10 different events with a Gold, Silver and Bronze card each. These foil cards are die cut in the shape of an Olympic medal. There are also 10 lenticular motion cards all based on the Olym-Picks characters. Speaking of those Olym-Picks characters, when they made them, they used a classic name for the A card and made up a new Olympic themed name for the B card, well they also made a C card that has the character’s other classic name! These are packed about 1 in every 100 packs. Here’s a few of the different packages for 2014 Series 1. On the Left we have a Retail Box (Not to be confused with a Hobby Box) The Retail Box holds 24 Packs with 10 Cards in each Pack for a grand total of 240 cards. I mentioned how you shouldn’t confuse a Retail Box with a Hobby box. 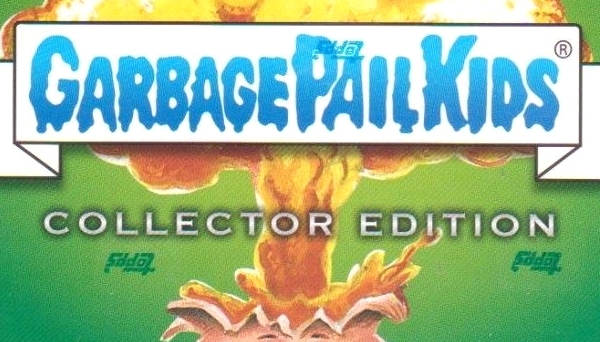 I say that because to a new collector, it’s very easy to miss the difference. That small H symbol shown above is the only difference in the outside appearance of the two boxes. What’s the difference on the inside? 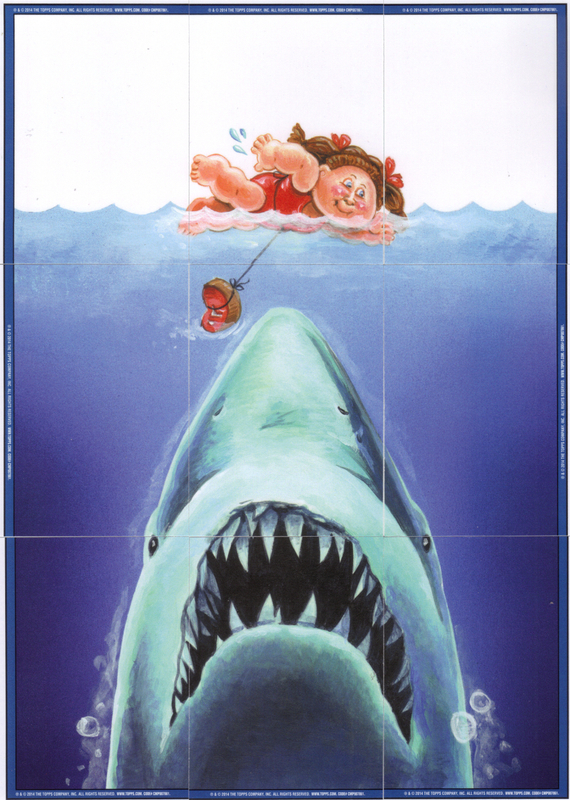 First off, there’s a bonus card. The retail box doesn’t come with one, also it appears that the Hobby Box will potentially have Artist Autograph Cards and Sketch cards. Those cards are 1:193 packs and 1:251 packs respectively. 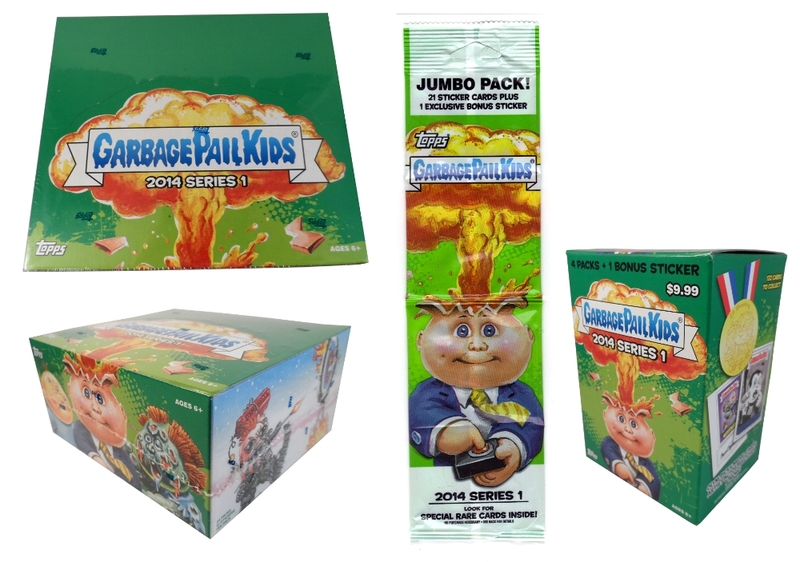 All in all, I think this is a fun new set of Garbage Pail Kids as long as you just focus on a base set and don’t worry too much about all the chase cards. A retail box can run you around $50 and you’ll get a full base set plus a lot of the more common chase cards. If you want to go whole hog into getting chase cards, a Collector Hobby Case will run you about $1,000 on ebay.